This article provides an overview of washgrinding segments, including types, selection and installation. For more information on please visit DIECUT’s washgrinding services. Selecting the appropriate washgrinding segments is dependant on the type of steel, the finish required and the amount of surface contact between the washgrinding wheel and the work on ground surface. It is important to arrange the work to be washground in a consistent way in order for the contact to be even. The harder the material or the broader the contact, the softer the washgrinding segments should be. If the surface to be washground is unbroken and covers a large proportion of the grinding area of the machine and causes the main motor driving the washgrinding segment head to throw out the electrical overload contacts, it may be necessary to arrange the washgrinding grinding wheel so that only each alternate segment makes contact with the work. When washgrinding components, maximum production is obtained if the total surface area of the work is 1/3 the area of the table top or less, and the fastest table movement possible is used. The washgrinding segments are marked with five different characters to identify the abrasive product used, grain size, grade of hardness, structure of the grain spacing and the type of bond used to keep the particles together. Most washgrinding segments are made of silicon carbide or aluminium oxide, both are manufactured abrasives. Silicon carbide is extremely hard but brittle. Aluminium oxide is slightly softer but is tougher than silicon carbide. It dulls more quickly, but it does not fracture easily therefore it is better suited for washgrinding materials of relatively high tensile strength. Abrasive grains are used according to the size of the individual abrasive grains making up the segment. The washgrinding segments are classified as coarse, medium, fine or very fine, depending on the size of the grain used. The components of the washgrinding segment are held in place by the bonding agent. The amount of bond in the segment determines the grade or hardness of the segment. More of the bond used or the strength of the bond, the harder the washgrinding segment will be. Soft segments will release the grains quickly and the hard segments retain the cutting grains longer. 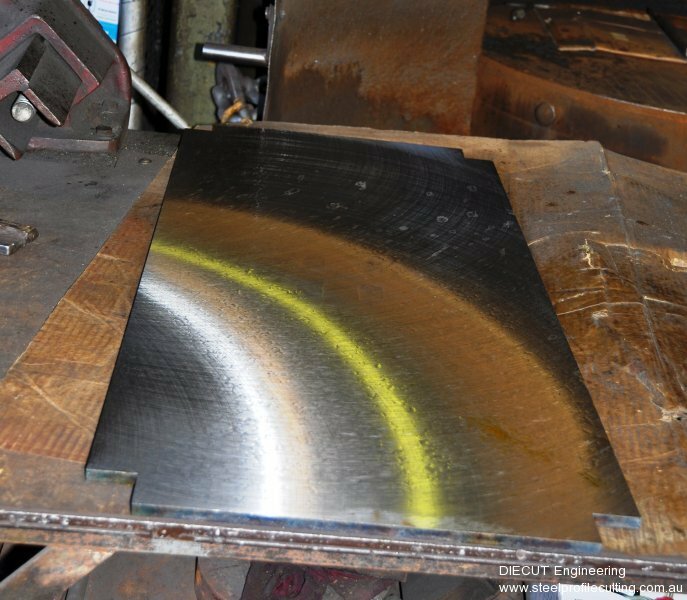 If a segment is too hard for a job, it will glaze because the bond prevents dulled abrasive particles from being released so new grains cannot be exposed for cutting. The types of bonds used include: Vitrified, Silicate, Rubber, Resinoid, Shellac and Oxycholride. Grade of hardness is dependent on the hardness of the bonded material used. A soft washgrinding segment is where the particles break away rapidly and a hard segment is when the bonds does the opposite. Most segments are graded according to the hardness by a letter system. Most manufacturers use a range in alphabetical order with A (very soft) to Z (very hard). Grain size affects the finish dependant on their size. When choosing a washgrinding segment the rules are: The softer and more ductile the material, the coarser the grain size. The larger the amount of stock to be removed, the coarser the grain size. The finer the finish desired, the finer the grain size. It may come as a surprise, that the harder the material being ground the softer the washgrinding segment should be used. Also the smaller the arc of contact, the harder the grade should be. The higher the work speed with relation to the segment speed, the milder the grinding action and the harder the grade should be. The better the condition of the washgrinding machine and spindle bearings the softer the segment can be. The spacing of the grains will also affect the finish. The softer, tougher and more ductile the material the wider the grain spacing should be. If a finer finish is desired then the grain spacing should be closer. When fitting the washgrinding segments, insert them so that they project about 3-4 cm. Tighten up wedge bolts and adjust backing stops. After running a short time it may be necessary to re-tighten the segments. Segments that are 15cm can be used until the lowest section of the backing stop permits (3cm). Wedge blocks and backing stops should be soaked in oil when the machine is resting over 12 hours (e.g. over holidays). The tables are designed to run at high speed for washgrinding ordinary work, and once the desired size has been achieved then the rotation should be changed to slow and the profile should only be allowed to pass two more passes under the segments, without adding any further feed to the wheel head. To let the profile to pass under the segments until all the sparking has ceased will course glazing and can create distortion due to overheating which should be avoided. If the profile is glazing or the main motor is overloading then softer segments should be used or the table load should be reduced (less parts). When the segments are wearing out too quickly, a harder grade of segment should be tried.